It is natural to worry about your dog coughing up blood, which is also called hematemesis. Vomiting blood is usually a sign of ulcers, bowel disease, inability to clot blood, esophagus problems, infections, liver failure, heartworm, or even head trauma. If you have seen this symptom in your dog, it is better to go see your vet because it could be due to tuberculosis, pulmonary disease, or another serious underlying health condition. Keep reading to learn the causes and understand when to seek veterinary help. Dog Coughs Up Blood, Why? When your dog vomits blood, you should not take it lightly. The vomit may contain digested blood or fresh blood with food residue. As mentioned, you will find a number of reasons why you have your dog coughing up blood. Here are some possible causes. This could be a sign of trauma or a dental problem. Bleeding in the mouth can irritate the stomach lining and induce vomiting. Your dog may vomit blood when they lick a bleeding wound. Finding blood in vomit and feces usually indicates the possibility of a stomach ulcer that bleeds periodically. An excess of gastric acid could be the underlying cause of these ulcers. The acid damages the stomach lining that can bleed occasionally. It is important for dogs to eliminate the blood through vomiting or else the excess of gastric acid will affect the esophagus and the stomach. Any lung wounds or a perforated organ may lead to accumulation of blood in the lungs, which will induce vomiting. Ingestion of bone splinters or other foreign objects can cause leave wounds in the stomach lining or the esophagus. Your dog may cough up blood when there are tumors located in the digestive system. Some medications have side effects, such as intestinal bleeding or stomach ulcers. Your doctor may vomit blood due to a rare blood coagulation disorder called hemophilia. Also, bear in mind that sometimes your dog cannot digest foods that are brown or red. When they vomit, it seems they have vomited blood, which is not the case. The best thing is to have a vomit sample tested by your vet to confirm your dog is actually coughing up blood. 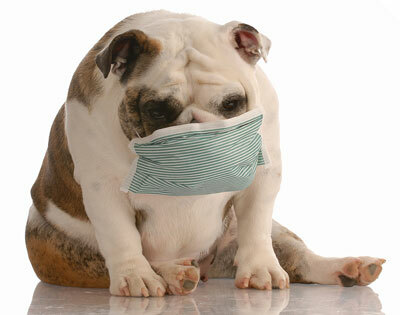 You should take your dog to your vet as soon as you notice your dog coughing up blood. Your vet will order different tests to determine the underlying cause of bleeding. They will usually start with a physical examination – they will examine the oral cavity of your dog as well as the area under the tongue. They will listen to the sound of the lungs as well. In some cases, your vet will also order a complete blood count to check the chemistries of the blood to know liver and kidney function. Tick tests are also common to find any signs of past or present tick diseases. Imaging tests are also quite helpful, so it's not uncommon for a vet to ask for radiographs (x-rays). Don't wait for things to resolve on their own. Once you have confirmed it is blood, you should take your dog to your closest veterinarian. Remember, any bleeding from the intestinal tract can have life-threatening consequences. The rate of blood loss is another factor determining how serious the condition is. Severe blood loss from diarrhea or vomiting can create serious issues and damage other organs as well. Having a closer look at why your dog is throwing up will also help understand the severity of the problem. Dogs usually vomit in a variety of ways and vomit many different things, from partially digested unidentifiable matter to undigested dog food. The color may be different, and its consistency may change. Pay attention to what it looks like and look for other symptoms as well, such as diarrhea. It is worth mentioning that you don't usually need to worry if your dog vomits once a day, but you should not waste any time if your dog vomits several times a day and has difficulty keeping anything down. Here are some other symptoms that warrant a trip to the vet. For instance, call your vet when you puppy is vomiting, your older dog is vomiting, or you notice signs of dehydration. If you suspect dog poisoning or notice your dog vomiting more than thrice an hour. What Can the Veterinarian Do? Once they identify the underlying cause, they can then determine the most appropriate treatment for your dog. The most common treatment options include supportive care with the administration of IV fluids, gastric protectants, anti-vomiting medication, and antibiotics or de-worming medications for your dog. In case your dog has swallowed a foreign object, your veterinarian will make use of a laxative to help your dog pass that object. They will also give your dog an antibiotic to prevent any infections caused by the foreign object. Your dog may have to stay at the veterinary hospital for a few days and require intravenous fluids as well. Finally, your dog may need surgery if the bleeding does stop even after a weeklong treatment. This usually happens when an ulcer tears.